The Timbuktu was giving me some trouble on the ride in to work this morning so I had to adjust it so that it was riding higher on my shoulder but it wasn't perfect and slipped a few times. I wasn't terribly happy with the situation so I left the bag and computer at work for the ride home. Got a late start from work but it felt really nice. It seems the AC broke yesterday and the building maintenance people got it fixed today and needed to test it out. Needless to say, I needed to go out and walk around the building a few times just to warm up. However, if I am going to start at 6 PM (and might) then I need to start bringing my headlight because it's getting dark enough by 7 PM where a light is warranted. Sure glad I wasn't driving today because except Fridays, this is route (highway) that I usually take home. While I don't do much religion I like riding by this sign to see if there is anything uplifting in their message. I see a sign but I am not sure that is the sign they want me to see or there is a sign. This is starting to sound complicated. Now this was pretty interesting. The rider of this contraption to my front looks like she was riding in Pajama bottoms. If I wanted to, I could have passed her but it was fun trying to pace her and breathing in her exhaust. She was luckiy there wasn't a police car coming down the road. Riding an unlicensed vehicle is a hefty fine. Back in Bethel a guy passed me on a little 80cc jobbie that it looked like he was commuting home on. 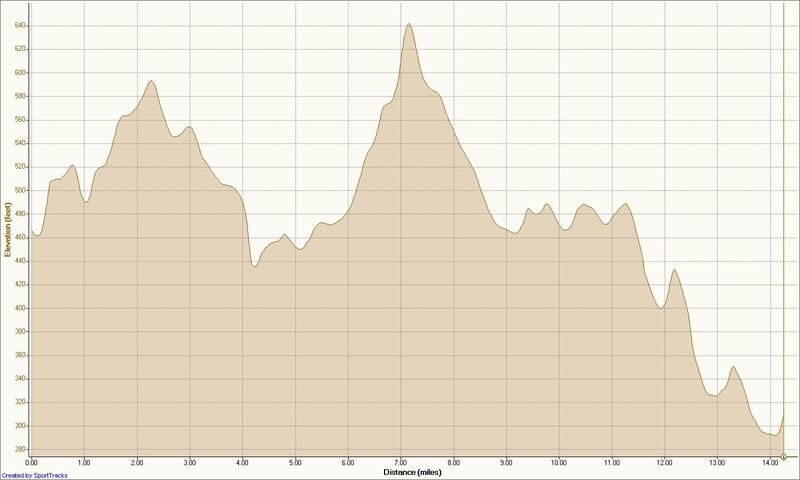 Here is the ride home profile. An additional 4 miles for the mile whore that I am with some fun climbs and and even more fun descents. The Stinson is really turning out to be a great bike. I think the only thing I need to do for it, besides finally putting some fenders on it, is get a longer seatpost. I think if I were sitting a little higher it would solve the problem of body movement while descending that disrupts the Wa of the bag sitting across my back.